This is the last review in our Lalaloopsy Toy Box Surprise series. This time we are focusing on the Lalaloopsy Littles. Lalaloopsy Littles are the younger sisters of the original Lalaloopsy doll characters. Each doll has their own unique personality and adorable pet. 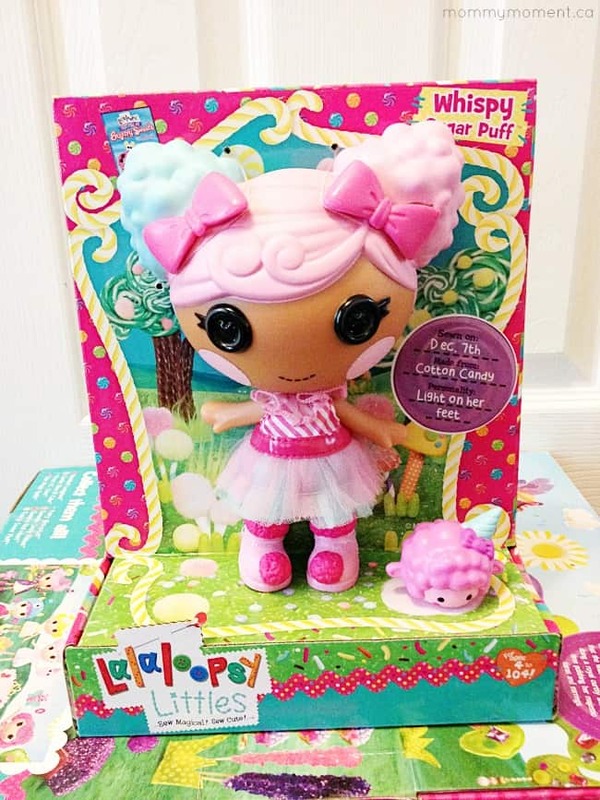 Lalaloopsy Littles doll Whispy Sugar Puff™ is light and airy and so sticky sweet. Sometimes she’s so light on her feet that a small breeze can lift her off the ground, but she always comes back down with a big sweet smile. As always, Lalaloopsy Littles will be a hit in your house. And you can WIN a Lalaloopsy Prize Pack valued at $100 right here! 1 CANADIAN Mommy Moment reader will WIN a Lalaloopsy Prize Pack featuring one of each of the dolls we have reviewed in our Lalaloopsy Toy Box Surprise series. To enter, leave a blog post comment letting us know who you would like to win this prize pack for. My girl would absolutely love this prize!! I would love to win this prize for my niece, she would be so excited! This would be awesome to win, I would gift it to my granddaughter, since her birthday is coming up!! My niece is a big Lalaloopsy fan, I’d give ti to her for her birthday. I would love to win for my niece!! I would love to win this for my niece! She loves Lalaloopsy! I would like to win this for my 4 year old granddaughter who is a big fan of Lalaloopsy. I would love to win this prize for my niece. She loves LaLaLoopsies. The little ones I babysit would love to have this to play with. I’d love to win this for my granddaughter. I would love to win this for my friends daughter. I would love to win this for my daughter. She would love it so much! I would love this for my grand daughter thanks for the chance! My niece would be thrilled if I won this for her! My niece Sophie – her birthday is in August and I know she’d love this! id love to win this for my neice shes a big lalaloopsy fan . my duaghter would love this! 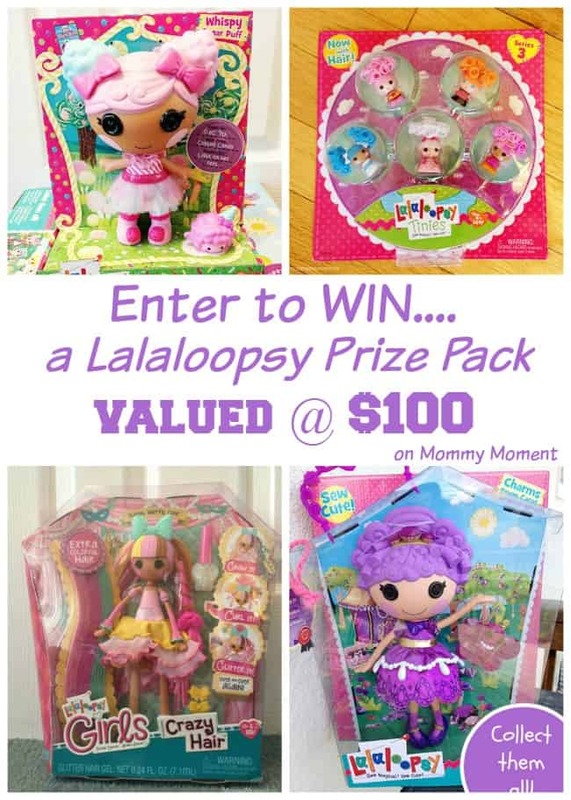 My daughter loves lalaloopsy – I would love to win this for her! I would gift them to my precious great granddaughters. I would love to win this for my granddaughter Maya. She would be thrilled. My little girls would love these! I would win this prize for my granddaughter. I would like this for my daughters. My granddaughter would just love this – thanks so much! I would love to win this for my daughter, she loves these dolls! I would like to win this for my great niece who is 4 years old. I’d love to win this for the my daughter. My niece would adore this prize pack! I would love to win this for Sophie. She loves Lalaloopsy. I would love to win this prize package for my niece and son to play with. My son loves Lalaloopsy too! I have a little niece who adores Lalaloopsy; she makes the most hilarious stories with her dolls! I would love to win it for my two niece. They love Lalaloopsy! i know my goddaughter would love this prize – thanks. I love your recipe for the Strawberry Chocolate Fondue. Is almond butter as available as the milk? I have been buying the milk but did not really look for almond butter. I love chocolate so will probably try this appealing and healthy dessert. Thank you for the recipe. My daughter loves Lalaloopsy, would be great to win. I’d give it to my 3 year old daughter who is in love with Lalaloopsy! I want to win this for my neighbors sweet daughter. My twin girls would love this so much! My grandaughter loves Lalaloopsy so I would like to win this package for her. I would for sure give this to my 6 year old daughter, she would love this! My 4 yo daughter would love this! I would love to win this for my daughter Ciara! This would be a wonderful gift for one of my students who would not normally get a present like this. I love this hope. to win. Ohh! My daughter would LOVE to win this one! Thanks so much!!! Form filled out. Little Miss J is going to be so excited!!! My friends little girl. She would do cart wheels to have this. I would love to win this for my daughter as well as a couple of girls that we are friends with. They do not have family here locally so we try to spoil them at Christmas, this would be a lovely touch! Thank you for the opportunity!